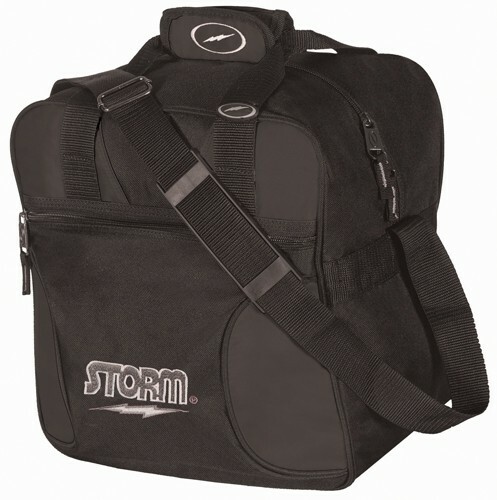 Don't miss out on all the features offered to the bowler in this Storm Solo Single Tote Black! This tote is designed for durability and the bowlers comfort. It features reinforced stitching, an adjustable non-slip shoulder strap, and it has a 1 year limited warranty. Wow! I was somewhat concerned when ordering this that I'd get a poorly made bag with thin fabric and undersized zippers, but was pleasantly surprised at the quality of materials used at this price point when it arrived. The embroidered logo on the side is a nice bonus, and looks sharp. I just started bowling last year with a friend. He dove straight buying advanced equipment. Im just a casual bowler so Im not sinking a ton of cash into things. Ive have great luck with this bag. I purchased this bag for my 11 year old son for Christmas. Every time he went surfing, he always told me this was the bag he wants. After looking over the other bags, we decided this was the best option for the money... Thanks bowling.com for making Christmas a little happier for a 11 year old boy. The side zipper on the side broke after using it for a week. Now the top zipper keeps opening after i close it. Everything breaks and stops working, and it's not worth $20. My bag arrived in just 2 days. When I opened it I was pleasantly surprised. The quality was much better than I expected. It's attractive and opens wide enough for easy access to my ball. I was afraid the color might be a little gawdy, but it is just perfect. I am very pleased with this bag and would recommend it to anyone. Very reasonably priced. By duney from Southaven, Ms. I have a 3 ball tote however,this product is good to use when you are taking a ball in for service. This is really not worth the money. I didn't return due to shipping costs donated the bag and bought a quality bag locally. Due to the time it takes to produce the Storm Solo Single Tote Black ball it will ship in immediately. We cannot ship this ball outside the United States.